Deep-fried tarantula. All the rage with tourists in Cambodia, I’m led to understand. The “bizarre-food” trend, spurred on by the likes of Andrew Zimmern, has yet another chapter, this time lurking deep in the spider holes of Cambodia. Intrepid (and unhinged) tourists in Cambodian towns like Kampong Cham Town and Sukon are invited to join the locals in hunting a regional delicacy – tarantulas. This “hunting” is done at night, and consists of jamming a stick into a hole. The tarantulas scurry out of their cozy nests, right into the hands of hungry morons tourists. Poor hairy bastards don’t stand a chance. Once caught, the creatures are deep-fried and served with soy sauce (of course), pepper sauce (as in the above photo), or more simply – with just a bit of salt and garlic. And, if a savory snack is not what you’re craving, you can get the little buggers mixed into a jackfruit-and-rice-wine cocktail. The spider trade is thought to have been in operation since the 1970s, when people forced into the jungle during the Khmer Rough’s regime survived by eating spiders and other bugs. 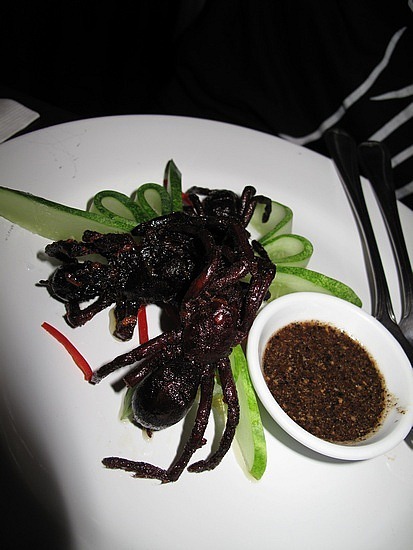 Locals found the tarantulas tasty and began to experiment with flavours and dishes. 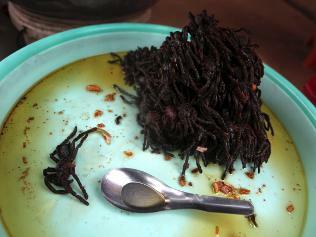 Not just for eating, many Cambodians believe in the tarantula’s medicinal purposes. They are thought to assist with anything from back aches to breathing problems in children, and are particularly effective when served with rice wine. Tarantulas in Sukon are sold for around 10 cents each, with tarantula wine sold for as much as $2.50. 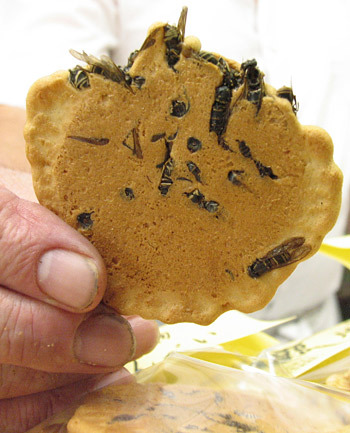 I think I will save my money for Japanese Wasp Crackers. I could eat those, but I’d need to be very, very drunk. Not me. No amount of alcohol could wash them down my throat. I had to suppress my gag reflex just to put this up. Really, I don’t know what compels me to do these posts.